As this blog is called “Uncharted Waters”, I feel a little entitled to keep the theme of my Pirate Adventures as part of this post. 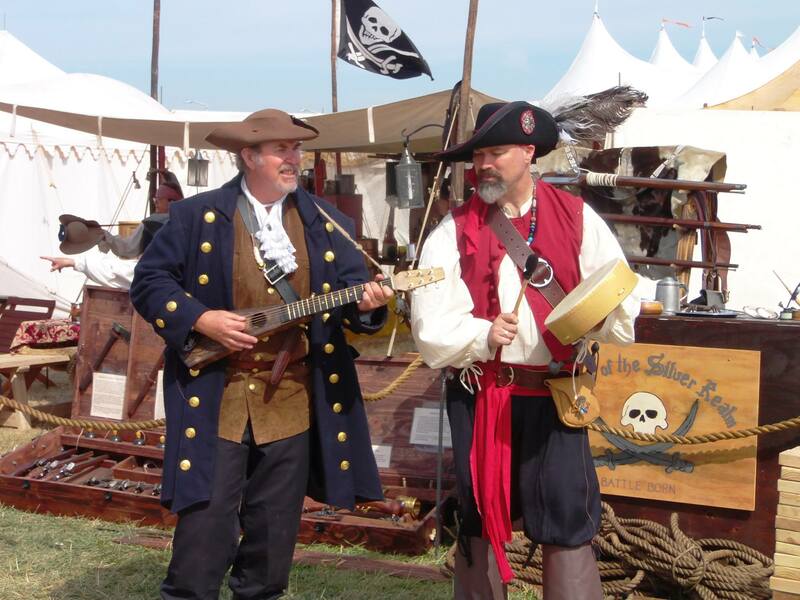 As some will remember with my last post, I talked about stepping back in time to participate in a weekend Pirate Encampment for the Northern California Pirate Festival. This was an event I’ve been looking forward to for several months, and it was my inaugural “voyage” with the Pirates of the Silver Realm, a re-enactment group centered in Reno, Nevada. I arrived early Friday morning prepared to do whatever was needed, and participate in whatever capacity they wanted to use me. As the group makes decisions democratically, I told the “Captain” to just point me to whatever needed to be done. One way or another I’d figure it out. During that early morning setup, I met another early-bird attendee, named Jeff, and as we got to talking we both realized we had musical backgrounds. He showed me a guitar he had made that was based on an old Martin Backpacker, but a bit more rustic looking. He also had a hand drum he packed, and as we were talking, I picked up the hand drum and started striking out some rhythms. In the process, I used my fingers to tap and drag along the underside of the drum head. Jeff looked at me a little quizzically, and then smiled. “You are one of the first people I’ve seen pick up that drum and know how to do that!” he said. “Do you know how to play that style of drum? I told him I did, and over the next few minutes, we hatched a plan to add a little something to the encampment. After we got the encampment set up, we both spent a little time looking at some songs that Jeff had worked up. Some songs I knew, others I’d never heard before, but by listening to Jeff sing and strum chords, I was able to sink into the groove and provide a drum beat and harmony vocals. By the following morning when the gates opened, we had added a duo that could perform as needed, and the combination made for a great addition to the encampment, according to both our crew and the reviews of the festival attendees. Why am I bringing this up here in this space? Too often, I think we come to new projects and ideas with both a large vision of what it could be, and a fear of inadequacy that we cannot fulfill the vision we have in our heads. I often face this reality when I embark on goals by myself. However, I typically have much better success when I talk with someone on my team, or perhaps someone I meet outside of work, who can complement the skills I have, or identify something I’m not even aware could be an asset. By talking with others and seeing what skills we bring to a goal, we might find that we can put something together that’s more than either of us would have done by ourselves (and that goes double for me and this past weekend, since I wouldn’t have just volunteered my voice without accompaniment). Together though, we were able to perform effectively, and cause others in the crew to ask us if not only would we consider repeating what we did, but expanding on it, and possibly making it a regular part of the encampments. It’s very easy to get overwhelmed or jump too far ahead in what we want to do, only to get discouraged when we can’t meet the perfect ideal we have constructed. A phrase I often think of is Arthur Ashe’s quote “start where you are, use what you have, do what you can.” I will add to that and say “look for others who are willing to do the same”. You may find that, with shared efforts, you may start a snowball rolling that will grow larger than anything you would have imagined.